1. Identify all the exterior window and door frames. These are the window and door frames that, if leaking, will allow unwanted hot or cold air into your home at the wrong time of year. As such, they are the most critical ones to check when it comes to making sure your home is using energy efficiently. 2. Turn on the infrared thermometer. 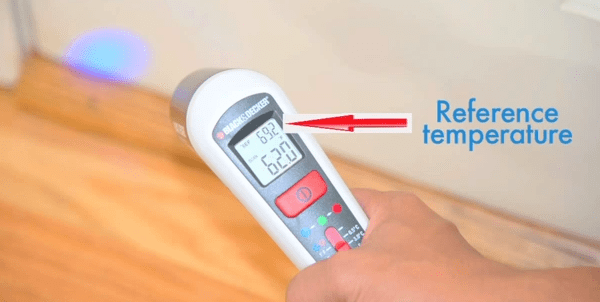 Most thermometers won’t have an on/off switch and all you have to do to turn it on is press and hold the trigger for a few seconds. After a moment the screen should start to register a temperature (in either Celsius or Fahrenheit) and you’re ready to go. 3. Begin checking the exterior window and door frames around your home. The first thing you’ll want to do is get a temperature reading for the room in which the window or doorframe resides. To do this, just aim your infrared thermometer at the wall near the frame. Take note of the temperature reading, and aim the thermometer at the frame. Once it’s aimed at the frame, slowly work your way all the way around it and pay attention to any spikes or drops in temperature. If the frame is sealed properly the temperature of the frame should be the same as the room in which it resides. However, if you notice a change in temperature it’s likely that you have a leak in your frame. 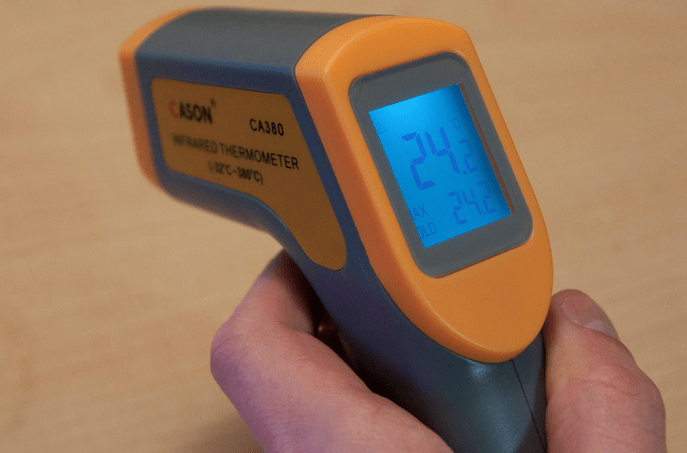 Some infrared thermometers will allow you to set a reference temperature on the device itself. If your device doesn’t do this than we recommend you write your reference temperature onto a piece of scrap paper. 4. Place a post-it note next to any areas that might indicate a leak. This will make it easier to come back and seal any leaks that you may have. Check out this article to learn more about how to seal your door and window frames. 5. Repeat steps 3 & 4 for all the exterior window and door frames in your home. It’s important that all the exterior window and door frames be checked for air leaks since one leak is all it will take to increase your heating and cooling bills. Once you’ve completed the audit of your home, be sure to go through and seal up any leaks that you’ve found. We recommend that you perform this audit twice a year (once in the summer and once in the winter). Window and door frames will shrink and swell a tiny bit with the change of seasons, and that cycle of shrinking (winter) and swelling (summer) can cause air leaks to form over time. By checking your frames on a bi-annual basis you’ll help ensure that your home is using energy as efficiently as possible. Looking for other ways to make your home more energy efficient? Be sure to check out our green home improvement projects: Green Living Ideas, after all, is a top 20 home improvement website! Photo is courtesy of the Flickr Creative Commons.